Our mobility shop is located at 872 High Road, North Finchley, London, N12 9RH. 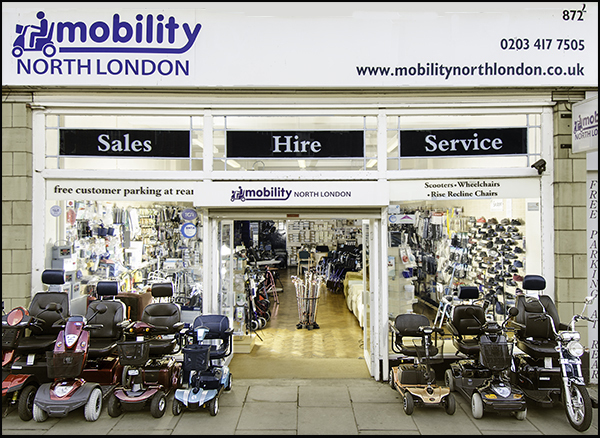 An independent, family owned retail shop located on North Finchley High Road, we supply a large variety of mobility products, for use both inside the home and out. Our products range from household aids, footwear and walking aids to larger items such as bathlifts, wheelchairs, scooters and powerchairs. We have a large display of rise and recline chairs and also supply beds and stairlifts. A range of equipment is also available for hire. The shop is based in Finchley but we cover the whole of the North London area. This includes Barnet, Whetstone, Mill Hill, Muswell Hill, Hampstead, Hendon, Golders Green. Also Southgate and the Enfield, Haringay and Islington boroughs. Our purpose is to make shopping for mobility needs a pleasure for all of our customers and their families. We strive to provide the best service possible, focusing on making our customers feel welcome and comfortable no matter what complexities their purchase may involve. We believe that the best approach to buying mobility equipment involves seeing the products yourself, so you can have the opportunity to get a feel for and compare products. Only then can you decide which item best suits your needs. We understand everyone’s needs and tastes are different and we endeavour to offer a wide variety of choice in every area of mobility products. We hold an enormous number of lines in the shop but if we don’t have the perfect product for you in stock, it is likely that one of our suppliers will be able to get it to us quickly. Ensuring peace of mind, knowing that they have someone to call on in the event of any problems they encounter with their purchase is important to our customers. Being able to deal with the same friendly team of people for after sales service is a rare find. Many also say how lovely it is to be able to find solutions to their difficulties all in one place. Parking is easy – spaces are usually available directly outside the shop (free for blue badge holders), Sainsbury’s nearby offer one hour free parking. Alternatively our customers are welcome to park at the rear of the shop in our yard area. We offer free delivery* in the local area (N10, N11, N12, N14, N2, N20, N3, NW4, NW7, NW11, EN4, EN5,) and we may be available to carry out home visits for larger purchases for those unable to travel to us.